American Thanksgiving means it’s time to bring out a thematic tie-in, and a creature with “Pilgrim” in its name will do the job this year. Specifically Ashling the Pilgrim, who keeps in with the elemental theme of going big or going home…you put in mana to get an effect, and if you put in enough mana, you get an EXPLOSION. Here, the EXPLOSION is in the form of a large blast to everything on-board, in exchange for all the +1/+1 counters on Ashling (which will also probably kill it, but who cares). To get it, you need to use Ashling’s ability thrice in one turn, which makes for an interesting ticking bomb scenario: do you increment Ashling up slowly before pulling the trigger, or do you just go for it at once? A 1/1 for 2 won’t win any awards, though Ashling can start pumping itself up quickly, so there is that. It’s a nifty card that offers several puzzles, and it’s probably best to not be in a food coma when you try to make this card work. One of the subthemes among Lorwyn‘s flamekin was the idea of building up to a cathartic explosion, represented by abilities that counted how many times they’d been activated in one turn. Soulbright Flamekin is another example. Ashling is probably the most versatile of those cards, as her activated ability can be used as a combat trick, as a threat that gets stronger until it demands an answer, or as a mass destruction effect that can take out Eldrazi given enough time and mana. The first two make her well suited to certain decks in one-on-one settings, and the latter makes her well suited to multiplayer and Commander settings where you might have more time and mana to spare. It’s been a long time since we visited Lorwyn in an expansion, but it’s never a bad time to play Ashling. 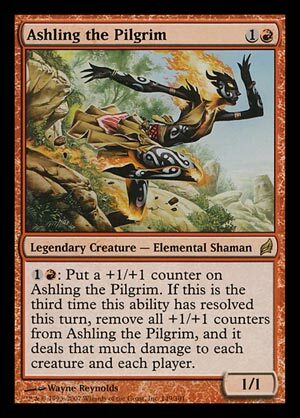 Much like the Pilgrims we all know about in America, Ashling was called that because she was on a quest, in her case to uncover the mysteries of Lorwyn’s nature. The whole story is in the Lorwyn and Shadowmoor novel tie-ins. It’s also been a long time since we had proper Magic novels, but I hear that we’re going to get comics again quite soon. Those will probably be worth checking out, even if just to remind Wizards of the Coast that things like that enhance the Magic experience!